Here's a look at the new first-class cabin of Lufthansa's new A380 planes by London industrial designers Priestmangoode. The new designs were unveiled today in Frankfurt and feature leather, suede, wood and marble-effect laminate. Priestmangoode have also designed new business and economy class cabins, to be retrofitted across all Lufthansa long-haul flights from next year. Update 13/06/11: watch Paul Priestman talking about trends in aircraft design in our movie on Dezeen Screen. Priestmangoode has designed the new flagship A380 for Lufthansa that has just been unveiled at a global media launch in Frankfurt. Priestmangoode designed the cabin interiors across all three classes with the First Class seat and cabin concept bringing the comfort and quality of the first class airport lounge on board. The new designs will be retro-fitted across the whole long-haul Lufthansa fleet, starting with the A330/340’s at the beginning of 2011. Lufthansa’s A380 is a leap forward in aviation design setting new standards in travel comfort, quality, technology and environmental efficiency, introducing the most luxurious and highest quality first class cabin yet. Employing the palette of leather, suede, wood and marble-like laminate in caramel, champagne, chablis, and grey-brown used in Lufthansa’s First Class airport lounge, Priestmangoode’s new first class cabin makes the cabin feel warmer and more domestic, as well as allowing a seamless transition between airport lounge and aircraft. eight seats offering single and double occupancy. The shells of the first row seat and second row ottoman are integrated using a seamless curve to give the cabin a more fluid and bespoke feel. “noise and sound close-out”. In response to passenger feedback, sound-absorbing curtains, cabin lining and flooring make this the quietest cabin in the sky. the widest seat environment in flight at 55cm between the arms and 80cm including the armrests. a completely lie flat bed measuring 207cm in length. an adjustable leather ottoman forms the end of the bed when in full-flat mode, and can be used to store personal items. no fixed partitions means the cabin feels open. Each seat has motorized retractable privacy screens that come out of the seat shell to create a semi-cocoon-like enclosure allowing privacy at the touch of a button. each seat is fitted with a monitor tower set behind the ottoman, and houses a cantilevered monitor with a state-of-the-art machined aluminium monitor shroud. a caramel leather credenza with an organic-shaped cocktail table with a textured white finish. The credenza houses a large one piece table with an extensive range of movement and accessible stowage areas for personal items. personal cabinets with garment bags and plenty of storage space replace overhead bins, making the cabin feel more spacious. the appearance of gadgets is reduced to a minimum: the main visible control button is the return to upright button for Taxi, Take-off and Landing, located on the cocktail tray. The other controls are located within the armrest. two reading lights: one for reading in bed, and the other “snake light” for reading upright. mood lighting features include a light beneath the cocktail table on the credenza, in the magazine recess pocket, an aisle kick-strip light running along the bottom of each seat, and a specific light illuminating the First Class iconic “red rose”. a world-first use of a pillow-effect antimacassar which provides optimum head support and extra comfort. the use of ultra suede applied to all windows, giving a softer VIP jet feel. a leather clad first class bar at the front of the cabin with subtle branding and inset aluminium text and integrated mood lighting. new branding: the famous Lufthansa logo has been re-interpreted for First Class and shows a matt white relief crane on a gloss white background. Priestmangoode also designed the Business and Economy Classes for the A380. Business class seats, located on the upper deck of the aircraft, have been upgraded and offer full-length high comfort beds at an angle. Semi-transparent dividing screens have been added throughout the cabin to create a series of more private zones. 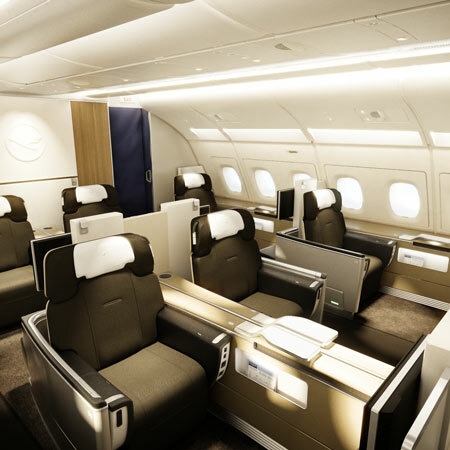 The corporate Lufthansa colour scheme of silver and blue with yellow detailing is used throughout business class. The cabin branding panel has been designed with an aluminium crane on a high gloss blue background. The new Economy Class seats feature slimmer seat back shells maximising passenger living space. The grey and blue seats with yellow reveals are supported by a cabin brand panel featuring a yellow crane on an anthracite background. Luke Hawes, Director of Priestmangoode says: “I see the A380 as a celebration of Priestmangoode’s continuing relationship of working on the Lufthansa brand. We have spent the best part of ten years working with Lufthansa on the refinement of their brand and product detailing. The A380 embodies the values that Lufthansa hold true; not only producing a great looking product but one which has amazing attention to detail and technical prowess. We see the A380 as the flagship but look out for more great designs on the rest of the wide body fleet and the new B747-8i”.